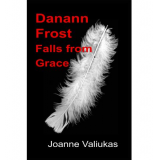 Author of Danann Frost Falls from Grace, a contemporary urban fantasy novel. Danann Frost is thousands of years old, yet young for her kind. She is a creature of the Light, an Angel, one of the Seraphim; a race of beings that live beyond our world. She has been cast out of paradise and Fallen from Grace, all for the love of a Dark One - a vampire. The only problem is, Seth did not want her and told her to go and not come back. Danann has made a life for herself amongst the vampires of this world and they protect her fragile nature. She and the vampire Asher live on the fringes of the human world; love and loyalty cannot separate them but trouble and vengeance are on their way. After two hundred years of enduring the crippling punishments of her Fall, Seth walks back into her life but he is bitter and angry and out for revenge. Thank God he is after someone else...or is he? Can Danann escape the dark intentions of her once-beloved for whom she Fell from Grace, or has she put all those that she holds dear in danger? Journey with Danann as she takes the path to taking back her Light and ascending to be Angel once more. Will the Archangel Uriel surrender her Light or will Danann be doomed to walk in darkness forever?